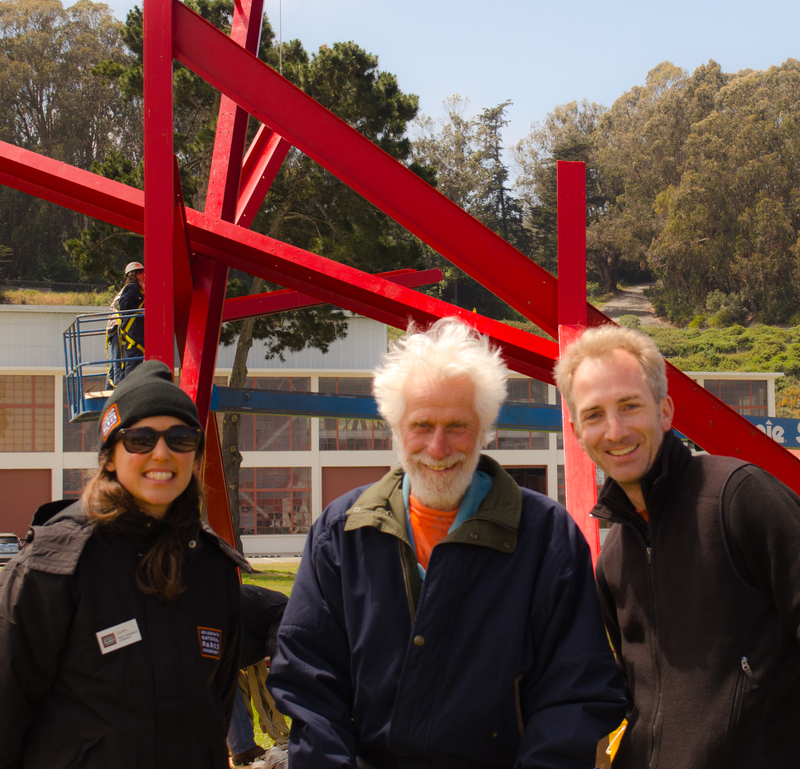 The Bay Trail Art Scen(ery): A di Suvero Skyline Rises from Crissy Field – The San Francisco Bay Trail: It's Closer Than You Think! While walking w ith Oscar along the San Francisco Bay Trail adjacent to Crissy Field this afternoon I met someone. Before I had a chance to actually come face to face with this person and say hello, I had already had a conversation with them and made a connection. It was the conversation you have with an artist as you admire their work. That is what artists do. They speak to their audience through ideas expressed through whatever medium they feel translates their most internal thoughts into external expression best; conversing with the masses in dialogues that continue as long as there are eyes upon their art. In this case it was sculpture. Sculpture on a massive scale. 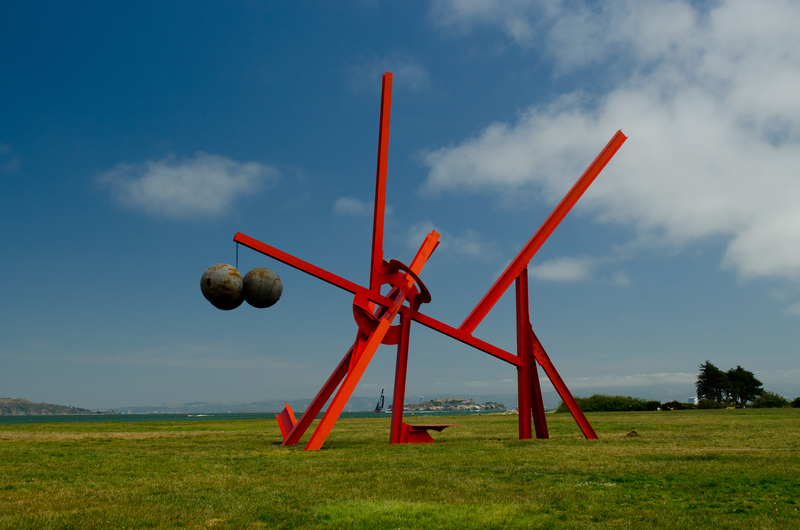 I had spent an hour admiring and photographing these amazing behemoths that now adorn our collective front lawn at the doorstep of the Golden Gate Bridge before approaching a uniformed young woman from the Golden Gate National Parks Conservancy named Jenny who was kind enough to introduce me to the artist, Mark di Suvero. Fortuitous for me, Mark happened to be on sight for the installation of one of his many sculptures that will adorn Crissy Field meadow until May 26th, 2014, clearly visible from the Bay Trail and scores of tourists, cyclists, runners and dog walkers passing by. I had apparently arrived at just the right time – another visitor, who was just leaving, had decided to take this opportunity to tell Mark that his art was a desecration. When Mark told me this – with a smile from ear to ear by the way – I noted the irony and pointed out another artwork of a massive scale that towered above us and that also garnered negative attention by those who claimed it was a desecration – the Golden Gate Bridge. I can’t speak for Mark, however I would have relished in the attention, even from a bitter detractor, just knowin g that I caught someone’s attention and made them think about something other than whatever “trial-of-the-century” was being played out on CNN. And, to Bitter Detractors credit, to approach an artist of di Suveros credentials and let him know exactly what you think of his work – well that took guts. 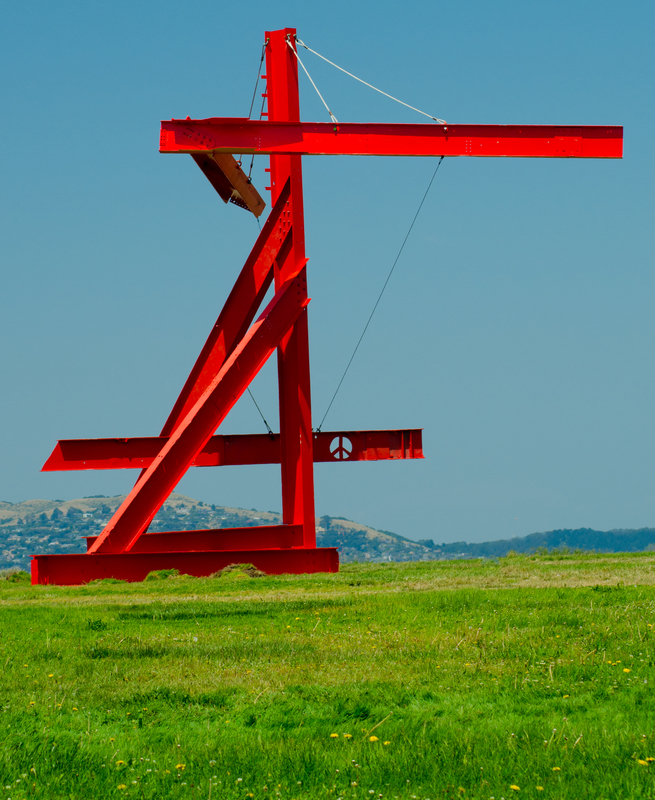 Mark di Suvero has engaged an entire city in conversation and most of us don’t even know it yet. The thoughts and ideas still percolating in the dark recesses of our over stimulated minds. I am not an art critic so I’ll spare you my interpretation of Marks art installation and simply say “THANK YOU!” Mark for dedicating your life to making people think in ways they never knew they could. Having the opportunity to meet this man was one of those special moments that do not come along very often. I only wish I could have spent more time with him and gotten to know him a little as he was truly one of the nicest guys I have met. So, the next time you see or hear or taste something that moves you, if the opportunity to introduce yourself to the person behind the stimulus presents itself, by all means take it. It will make a sublime experience, epic!